The latest version of My IBS Diary allows you to create reports from your diary. These could be very useful in your visits to your doctor, and allow you to review the progress of your condition. To create a report, open the Jump to date menu by pressing the menu key in your phone, or the calendar icon on top of the screen, then choose Import/export. 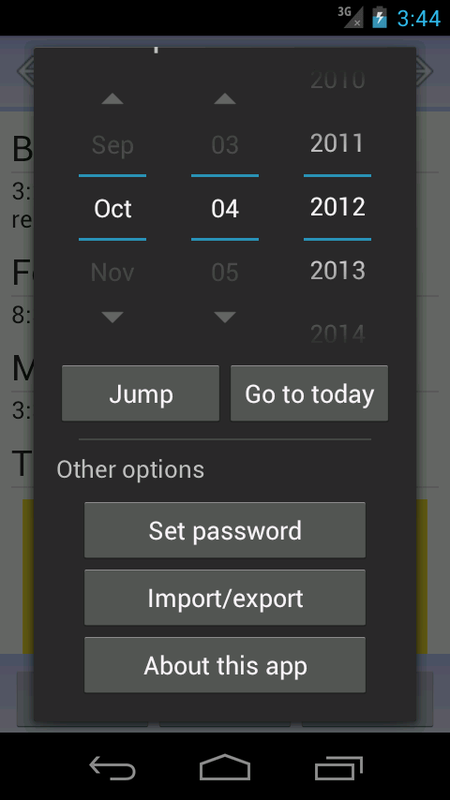 Now enter the date from which you want the report to start, and tap Export CSV. Connect the phone to your computer, open a file explorer and look for a file called diary_[date and time].csv that has been created in your SD card, inside a folder named IBSDiaryBackup. Depending on several factors, your computer may show this folder inside a unit called "Internal Storage". It is advised that you copy and paste this file to your computer's hard drive. Note: if you cannot find the diary_xxx.csv file, please try rebooting your phone first. If this does not work, please email us to the address below. You can now review or print the report using many different applications. Google's online spreadsheet service (see here) is a very easy to use option that can directly import and sort your diary entries. Simply start a new spreadsheet, go to File > Open, then Upload, then drag and drop the CSV file to the browser tab. Google Sheets will automatically import all the data from the file. First create a blank spreadsheet. Now, on the Data toolbar, select From text. A 3-step import wizard will start. On the first step, make sure data type is set to delimited. On step 2, make sure text qualifier is set to a quotation mark ( " ), and delimiters is set to comma only. On step 3, simply click Finish. You should now see your report in the spreadsheet. The Sort options in the data toolbar are especially useful to order the items in chronological order. If you have any doubts, please contact us at lifestylesoftwareinfo at gmail dot com. Thank you for visiting the Lifestyle Software site! Please click here to learn more about us, or go here to learn more about My IBS Diary, an Android application that lets sufferer of irritable bowel syndrom get their symptoms under control.